Misfit dislocations form self-organized nanoscale linear defects exhibiting their own distinct structural, chemical, and physical properties which, particularly in complex oxides, hold a strong potential for the development of nanodevices. However, the transformation of such defects from passive into potentially active functional elements necessitates a deep understanding of the particular mechanisms governing their formation. 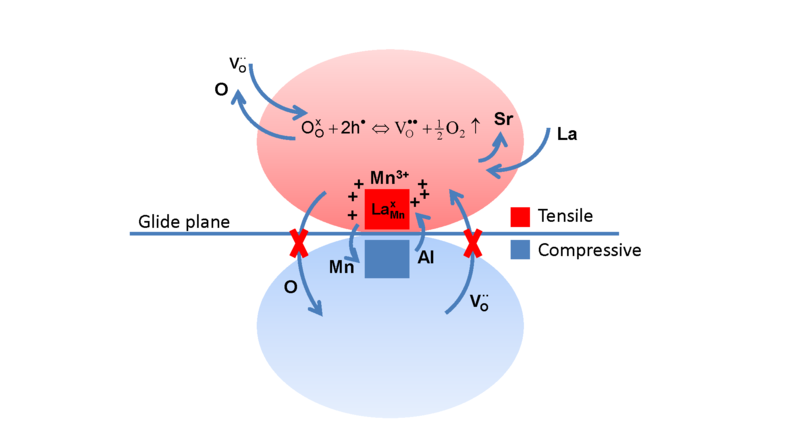 Here, different atomic resolution imaging and spectroscopic techniques are combined to determine the complex structure of misfit dislocations in the perovskite type La0.67Sr0.33MnO3/LaAlO3 heteroepitaxial system. It is found that while the position of the film–substrate interface is blurred by cation intermixing, oxygen vacancies selectively accumulate at the tensile region of the dislocation strain field. Such accumulation of vacancies is accompanied by the reduction of manganese cations in the same area, inducing chemical expansion effects, which partly accommodate the dislocation strain. The formation of oxygen vacancies is only partially electrically compensated and results in a positive net charge q ≈ +0.3 ± 0.1 localized in the tensile region of the dislocation, while the compressive region remains neutral. The results highlight a prototypical core model for perovskite-based heteroepitaxial systems and offer insights for predictive manipulation of misfit dislocation properties.